There is something so disarming, so human, about reading that the ancient Greeks and Romans kept dogs as pets – not just as hunting hounds, but also as tiny companions. The Melitan, while it is not the only kind of miniature dog mentioned in surviving texts (a “Gallic miniature dog” was named once in Martial’s epigrams), it is by far the most the most prolific miniature dog in artistic depictions and literary sources. Greek writers called it the Μελιταῖον κυνίδιον (Melitaion kunidion), while Latin writers termed it the Melitaeus catulus. The dog’s name is also sometimes rendered the Melitean, Melitaean, Melitæan, Melitaian, or Maltese in English; I have chosen to call it the Melitan because this name is the shortest and thus the least likely for me to misspell, and it also distinguishes the dog from its modern namesake the Maltese Terrier, which it does not closely resemble. The “Melitan” part of name was said to indicate that the dogs came from Melitē, a name given to at least two different places in the Ancient world. 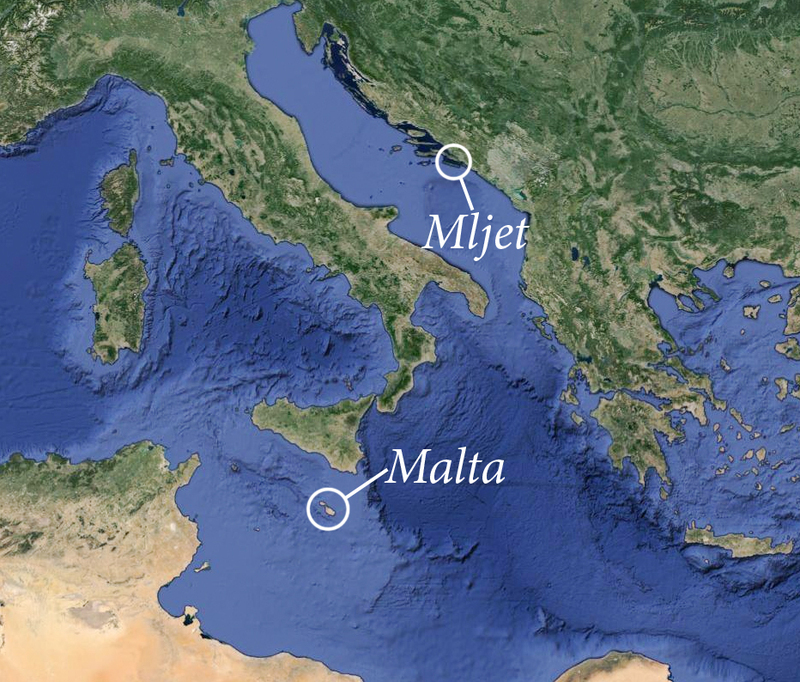 Strabo says that the Melitan miniature dogs came from the island of Melitē near Pachynus (Cape Passaro) which is now modern Malta, while Pliny the Elder claims that the dogs came from the island of Melitē in the Adriatic, now known as Mljet in Croatia. We cannot be certain about whether the Melitan dogs originated from an island the south or the north of Italy, or indeed whether both writers were just guessing. All that we can know is that the name was thought to indicate the dogs came from a place called Melitē. The other part of the Melitan’s name in Greek and Latin is fairly straightforward and easy to understand. κυνίδιον (kunidion) and catulus both reference the miniature size of the dog. The Greek term κυνίδιον (kunidion) is the diminutive of the word for dog, κύων (kuōn), and thus means “little dog.” The Latin word catulus meant puppy, though in this case it could also be used to signify adult dogs of a toy breed. And so the name in both languages indicates a small, puppy-like dog. We can gather quite a lot about how the Melitan looked. This is all thanks to the large corpus of surviving depictions of it across vastly different artistic styles and media, including vase paintings, grave reliefs and terracotta figurines. 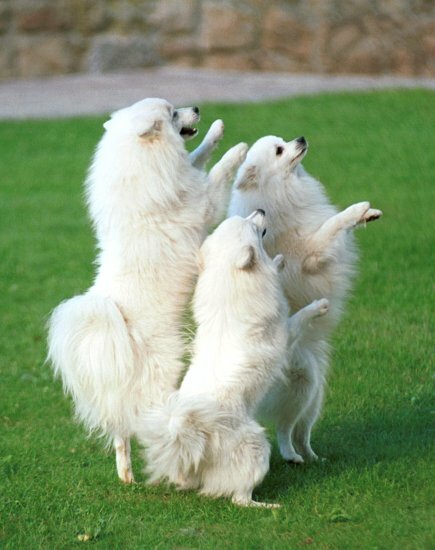 The Melitan was a small, fluffy, spitz-type dog, commonly white in colour. While there is a tendency today for many toy dog breeds to be brachycephalic, or to have shorter, squished-up noses, the Melitan was depicted with only moderate brachycephaly at most. It was a fairly proportional miniature dog with a very appealing, pointed, fox-like muzzle. It is a shame that the original vase is now classed as “lost, unattributed.” The earliest reproduction of this sketch I can find is from Otto Keller’s monograph on ancient animals, Die Antike Tierwelt, dated 1909. It is a curious piece of work. The dog seems to be outlined with a double outline, which makes me unsure of its colour, whether this individual could have been dark-bodied with a light-coloured outline and socks. The inscription is also puzzling. It is not that unusual to see Greek inscriptions written backward, but the word spells ΜΕΑΙΤΑIΕ, instead of the expected ΜΕLΙΤΑIΕ. This may have been a copyist error, since a stray chip in the black background under the Lambda (Λ) could have made the letter look like an Alpha (A). While I had been somewhat skeptical of this drawing at times, I am now rather convinced that these unintuitive quirks are unlikely to have been deliberately forged. It is simply unfortunate that pieces of pottery like this one are often not given their proper value and are lost or misplaced in collection records. 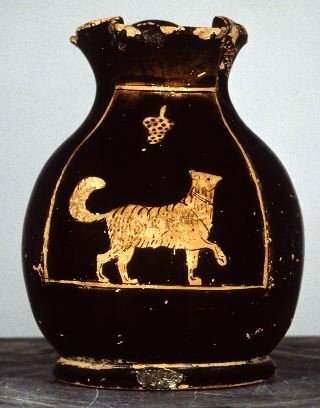 The Melitan dog on vase paintings is quite small, very fluffy, and has distinctive spitz-like features. It has a sharply pointed nose (which is not hairy like a Maltese Terrier’s nose). The Melitan’s ears are triangular and pointed, standing upright. Its tail often curls up over its back. 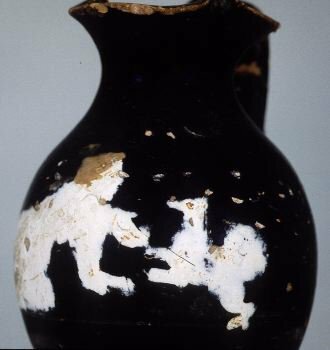 There are several Melitan dogs painted on the chous type of pottery, which was a small drinking vessel often decorated with scenes of children playing. 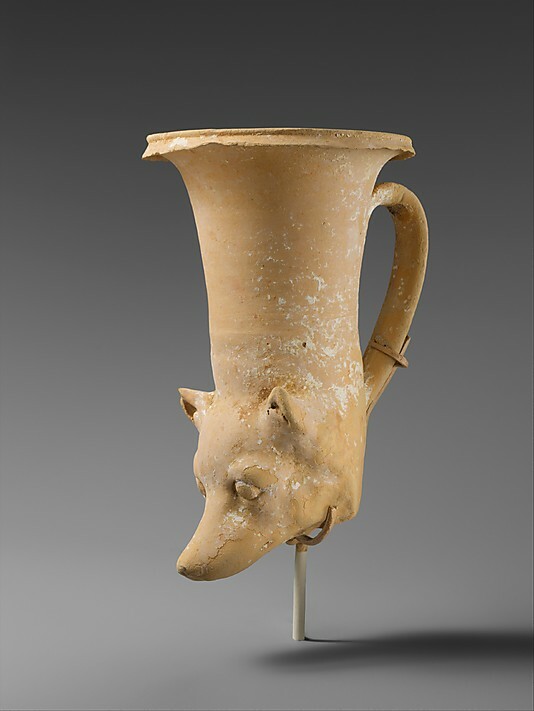 The following chous is one of the slighty older variety, and the dog is closest in form to the dog of the lost amphora of Vulci. The tail is curly and held high, but it does not coil over the dog’s back. The dog’s nose is short, pointed and not hairy, its ears are triangular and erect. The colour of the dog is unclear but may have been brown with thin dark guard-hairs, unless those lines on its body were just meant to indicate its fluffy coat. The chous below shows a child playing with an energetic Melitan, a white, fluffy spitz-type dog that has a fairly long, pointed muzzle. Its tail is curled completely over its back and is rendered like a big ball of fluff. The painter has clearly chosen the dog to be shown in white since the child’s hair has been painted in brown. Therefore we can at least say that white was at least one of the colours of the Melitan. The next chous shows another very playful Melitan. In a strangely self-referential twist, the dog seems to be running off with a little chous on its back. Once again its colour is ambiguous since the hairy lines on its back may indicate shading. The dog has distinct spitz-type facial features, with its fox-like pointed nose, clean face and upright triangular ears. Its tail is curled up completely over its back. The final chous in this section shows a rather darling dog. A child with reverse swastikas on his tunic and a bizarre hairstyle is rather cruelly teasing the dog with a pet tortoise on a string. One can definitely make out the dog’s familiar spitz-type features: the pointed snout, the triangular ears, the lack of long fur on its face, the thick coat of the neck and body, and the curled tail. It has been given white claws, which may indicate that the dog itself was meant to be brown or reddish in colour, but it is difficult to tell whether the colour choices in this picture were the result of naturalism or aesthetic considerations. I particularly love the tenderly-drawn face of the dog on the last chous. In my opinion, it ties in very nicely with the next piece of pottery: a rhyton, or animal-headed vessel, from Hellenistic Apulia. It is an amazing feeling, to think that this is the face of our Melitan. Observe its pointed fox-like muzzle, triangular ears and imploring, puppy-like expression. The modelling of the face is very soft and tender. The whole vessel appears to have been painted white, one of the known colours of the Melitan. Only faint traces of the white paint remain. In addition to these pots, there are several relief-carvings of the Melitan miniature dogs on children’s graves. These start to appear from about the same time as our rhyton and continue in the record for centuries afterwards. A young girl named Melisto is shown dressed in a very neat set of clothes, with a flowing dress-length chiton and an epiblema (or shawl) draped about her. Her hairstyle is very tidy and falls into tight curls. While she may be dressed up all neat and proper like an adult, she is clearly acting out her childlike nature: she is holding a doll in one hand and a small bird in the other, and teasing the little Melitan dog with the bird. It is a poignant image, because an untimely death has robbed this girl of the adulthood that would so befitted her. But the only memories we will ever have of dear Melisto will be of her playing with her toys and with her little dog. The detail below shows the particular features of this tiny Melitan puppy, so small that it barely reaches the little girl’s knee. Like the girl, this dog has been immortalised in stone in its smallest form. It has the proportionally miniaturised spitz features: a pointed, fox-like snout, thick fur on its neck and body, and a fluffy tail which curls over its back. 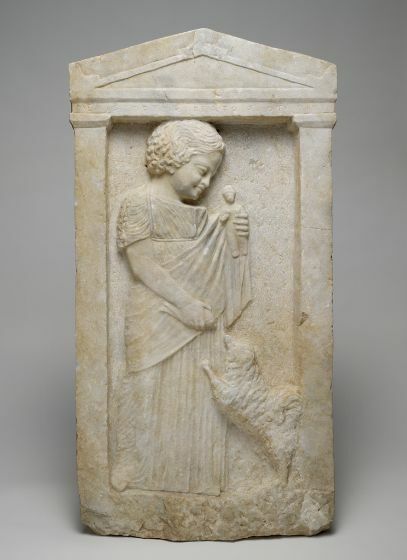 There are several other very poignant images of Melitan puppies playing with children on grave steles, including a game of fetch. For those images and more, I invite you to check out my board at Pinterest where I have collected all the images that I could find. 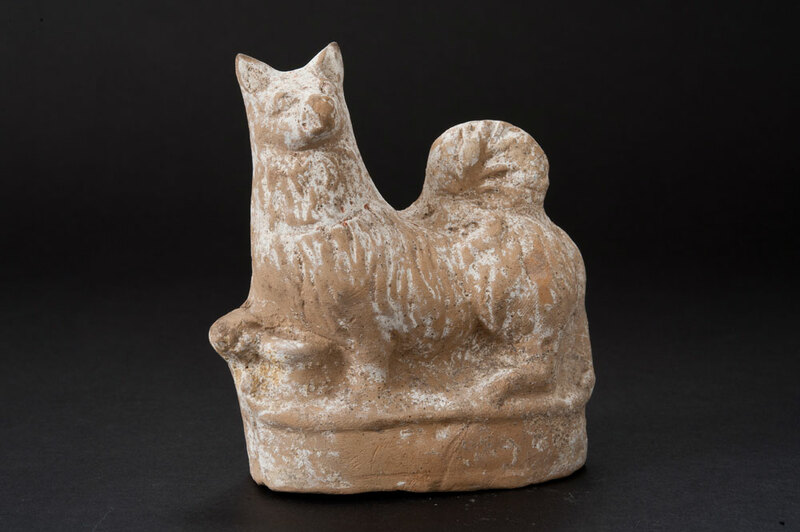 For now let’s move on to the last medium in our quest for the likely appearance of the Melitan miniature dog: terracotta figurines. Little clay figures of the Melitan appear from Hellenistic times onward and are the most prolific and widely dispersed depictions of this miniature dog. They show not only that the dog was hugely popular over a very large part of the Roman empire, from Greece to Egypt, from Italy to Turkey, but also that it was commonly white in colour. For instance, the askos below (a small bottle for pouring oil into lamps) has clear signs of being once painted all over in white. The usual spitz-type features recur once again. This artist has separated the thick-furred neck ruff from the short-furred face by a sharp dividing line. The dog has a pointed muzzle and triangular ears. The Melitan figurine below also shows obvious signs of having been painted white. It is hollow inside and rattles when picked up, which has led archaeologists to suspect it is a child’s rattle. 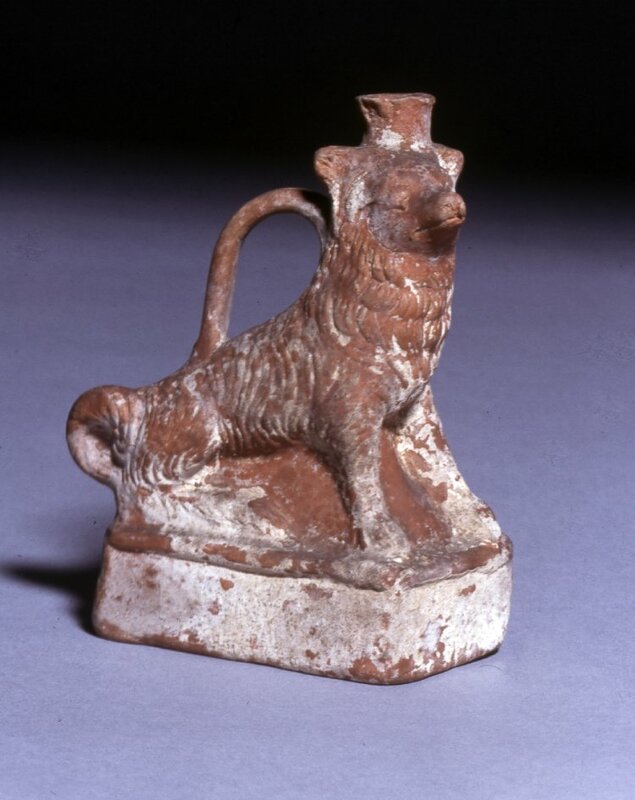 The notes on this object say that there are traces of dark red or orange paint on the collar around its neck – it may have originally been a white dog wearing a red collar. This pottery-maker’s style is very different from the above example, but the object clearly shows the same miniaturised spitz-type dog. Terracotta figurines are the largest group of findings which depict Melitan miniature dogs. Although I would like to talk at length about each one, I think you’ll be content to know that once again, there are more terracotta Melitan artefacts of this kind on my Pinterest board. 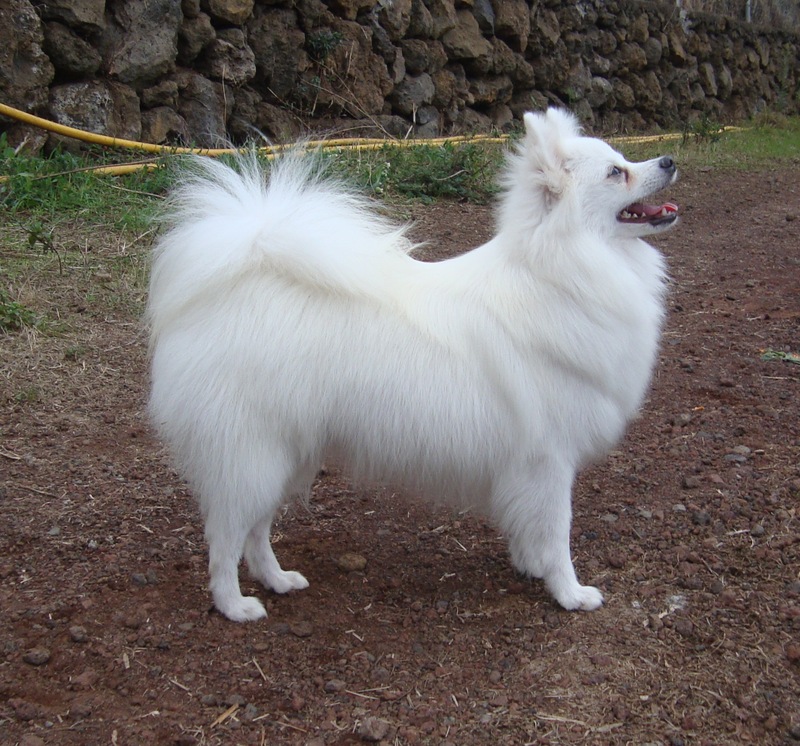 In summary, the Melitan looked much more like a miniature spitz-type dog than it resembled any Maltese Terrier. 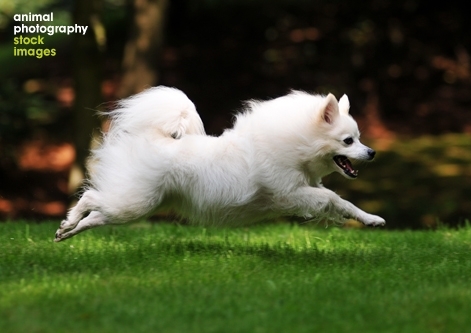 The dog pictured above is a modern Volpino Italiano, an energetic miniature spitz-type breed. It displays many of the same conformational features as the Melitan. Other small modern spitzes, like the Kleinspitz and the Pomeranian, can also look very much like the Melitan miniature dog. However there are several lines of Kleinspitz and especially Pomeranians which exhibit more pronounced brachycephaly. The result is a teddy-bear-like muzzle, short and stumpy, which is rather different from the delicate, pointed, fox-like nose of the Melitan. I’m personally quite happy that brachycephaly is not the only measure of cute in dogs, and these Melitans, the most popular lapdog of antiquity, were certainly adorable. While the artistic sources give us a good idea of how the Melitan miniature dog looked, the literary sources can tell us more about their behavioural characteristics and what people thought about them. The Melitan’s charms and foibles are very similar to those of small companion dogs in our society. They lived in pampered luxury and did no real work except to amuse their owners. They were affectionate and sweet, but as is the case with small breeds today, enamoured owners often failed to correct problematic behaviours like yapping. Apparently, bad-mannered Melitans were sometimes still seen as “cute” by their owners while others expressed their dislike of the spoiled little beasts. In medicine, Melitans were said to cure stomach ailments when held against the affected area. 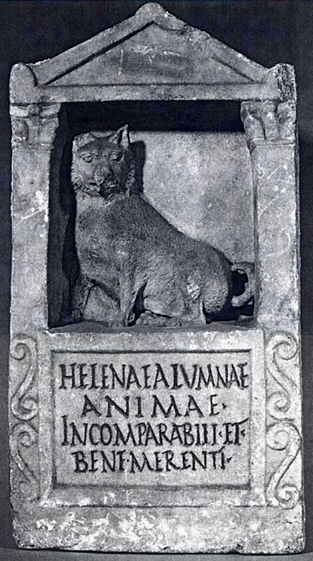 Probably the most affecting tribute to the dog’s imprint on human beings, though, comes in the form of a gravestone erected to a dog called Helena. The gravestone praises the dog for her merits and asserts that she fully deserves the honour of such a lavish burial. No single reference to the Melitan describes the dog’s behaviour in comprehensive detail, but when taken together each of these literary sources can help build up a larger picture of what the Melitan miniature dog meant to humans some 2,000 years ago. But that man is out of his wits who is annoyed and pained that he is not at the same time both a lion “Bred on the mountains, sure of his strength,” and a little Melitan dog cuddled in the lap of a widow. – Plutarch, De Tranquillitate Animi, 472c. In this instance, Plutarch imagines the dog as a soft-natured companion animal for a lonely widow. It is a rather touching little word-picture, if perhaps a little trite. 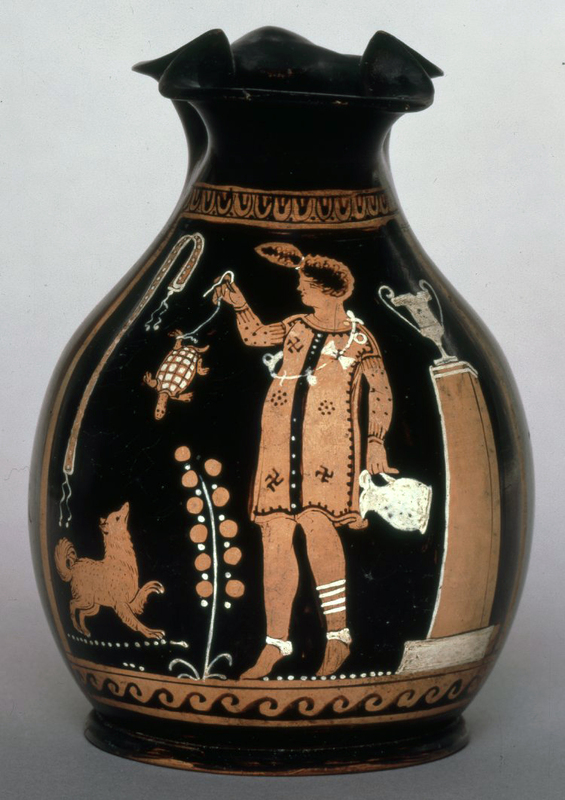 I should mention that while the dog was often stereotyped as a fluffy companion of women and children, there are also reports of male owners who loved their Melitans: the prideful character in Theophrastus, and a returning general in Aelian. I find it rather similar to how Richard Hammond and many other men own poodles, because they are a good dogs, even though there is a vague public sentiment that the poodle is a female’s dog. The contrast between the two creatures could not be starker: one animal is a house-pet, the other is a beast-of-burden. One learns cute tricks and is given treats, the other works for oats. Like many other spoiled toy dogs today, Melitans were sometimes criticised for being yappy and badly behaved. Lucian, in this piece of satyrical fiction, described a lady asking the main character Thesmopolis to dog-sit her Melitan while she was travelling. It was affectionately named Myrrhina (or “Myrtle”). Thesmopolis was not very impressed with the dog’s manners. It really does seem that some owners can let little dogs get away with troublesome behaviours because they’re so little and cute. “…I only ask you, because I know you are to be trusted; you are so good-natured and affectionate! I want you to take my little dog Myrrhina in with you, and see that she wants for nothing. Poor little lady! She is soon to become a mother. These hateful, inattentive servants take no notice of me when we are travelling, much less of her. You will be doing me a great kindness, I assure you, in taking charge of her; I am so fond of the sweet little pet!” She prayed and almost wept; and Thesmopolis promised. Imagine the ludicrous picture. The little beast peeping out from beneath the philosophic cloak; within licking distance of that beard, which perhaps still held traces of the thick soup of yesterday; yapping away with its shrill pipe of a voice, as little Melitan dogs will; and no doubt taking other liberties, which Thesmopolis did not think worth mentioning. That night at dinner, the exquisite, his fellow traveller, after cracking a passable joke here and there at the expense of the other guests, came to Thesmopolis. “Of him,” he remarked, “I have only this to say, that our Stoic has turned Cynic.” According to what I heard, the little animal actually littered in his mantle! – Lucian, De merc. cond., 34. The joke about the Stoic turning Cynic, of course, is funny because the Cynic school of philosophy was named after the Greek word for dog (kuōn or cyon) because of their complete disregard for civilised behaviour. Being soiled by a badly behaved dog would certainly qualify you for Cynicism. The Melitan could also be portrayed as greedy. In another piece of literary fiction, a letter made up by Alicphron for his character sketches, one very unfortunate dog called Plangōn (wax puppet, or “Dolly”) was accidentally killed in a fox trap. I set a trap for those confounded foxes, and hung some pieces of meat on the trap. They ravaged my vines, and, not content with picking a few grapes, carried off whole bunches and pulled up the plants. The news came that our master would soon be here; he has the reputation of being harsh and bitter, a man who, at Athens, is always worrying the assembly with all sorts of proposals, not to mention that his spitefulness and violent speeches have brought many to the Eleven. With such a man, how could I help being afraid of the same lot? That is the reason why I was so anxious to hand over to him the thief who stole his grapes. Alas! No fox appeared; but Plangon, the little Melitan dog, which is kept for our mistress’s amusement, smelt the bait and flung himself upon it, for he is a terrible glutton. For three days he has been stretched on is back, lifeless, almost in a state of putrefaction. Without thinking, I have brought one misfortune upon another. How can I hope for pardon from a man of such cruel disposition as our master? No, I will run away as fast as my legs can carry me. Good-bye to country life and all that I possess. It is high time to save myself, and not to wait for misfortune, but to look after myself before it comes. The letter reveals the character’s great anxiety at killing the pet dog, and his view that the dog was awfully greedy. He may not have personally liked the Melitan dog, but he knew there was most certainly hell to pay if the dog was hurt (or killed!) under his care. We give the one general name of praecordia to the human viscera; for pains in any part of which, a sucking whelp is applied, being pressed close to the part affected. The malady, it is said, will in such case pass into the animal; a fact which may be satisfactorily ascertained; for on disembowelling it, and sprinkling the entrails with wine, that part of the viscera will be found affected in which the patient himself was sensible of pain: to bury the animal in such a case is a point most religiously observed. The dogs, too, which we call Melitaei, applied to the stomach every now and then, allay pains in that region: the malady, it is supposed, passes into the animal’s body, as it gradually loses its health, and it mostly dies. Poor little Melitans. Pliny’s ancient remedies tend to resemble folk medicine and speculation more than they resemble the modern medical profession. Not all Romans were as indifferent to the death of the Melitan dogs, as this final text demonstrates. This isn’t a literary text, actually, but an inscription on a gravestone. Nevertheless I find it really drills home how much people valued their small dog, the Melitan. For Helena, nursling, a soul incomparable and well-deserving. I found it difficult to translate alumna because it means something along the lines of a female child who was not born in the house but adopted, brought up and nourished by the family. “Nursling” is only one of several possible renderings; “foster-daughter” would be better but in dog circles “foster” means something rather different. In any case this tombstone is very touching tribute to the companion dog. Helena was so loved by her family that on her elaborate gravestone she was given the honorary title of alumna to mark her membership of the family. In summary, the Melitan was a miniaturised spitz-type dog. It had a fluffy neck and body, short-coated face, pointed muzzle, triangular ears, and a tail that curled over the back. The dog was often depicted as white in colour, though it is also possible that it also came in browner shades, at least in the early evidence from vase paintings. It was an energetic, playful companion dog especially popular among children and women, though it was also owned and loved by men. Doting owners sometimes tolerated problem behaviours like yapping in their Melitans, which other people, particularly dog-sitters, found annoying. They were sometimes used in folk medicine. And one family even set up an elaborate and heartfelt gravestone to their Melitan dog. 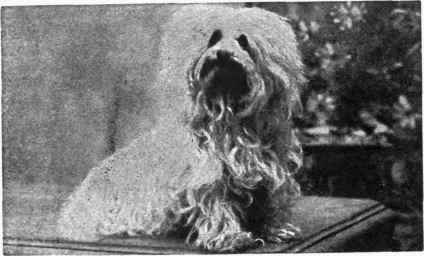 The Melitan miniature dog did not closely resemble the modern Maltese Terrier. The dog we now call the Maltese is not a spitz-type at all; it has floppy ears and a thick hairy nose. Although many Maltese fanciers claim their dogs descended from the ancient Melitan dogs, I find it more plausible to suggest, as Retrieverman did, that the modern “Maltese” was formed from the Bichon Frisé. The only points of similarity between Melitans and Maltese Terriers are that they are small, white and fluffy – traits which they would also share with white Toy Poodles, Powderpuff Chinese Crested, and of course white miniature spitz-types. The Volpino Italiano, the Kleinspitz and the Pomeranian can resemble all of the main features of the Melitan. I’m purely speaking about appearances, since I doubt that any genealogical link to the modern breeds can ever be established (unless a mummified Melitan among the great multitude of dog mummies found in Egypt is mined for DNA samples). While the ancient dog seems to have only exhibited mild levels of brachycephaly, I find that a few Kleinspitz and many Pomeranians are now being produced with shorter muzzles. If anyone is charmed by the most popular lapdog of antiquity, I would encourage interested breeders of Kleinspitz and Pomeranians to preserve lines of the longer muzzled type – in Pomeranians these are called “fox faced,” but I find that even many of the “fox faced” Poms have quite shortened snouts. The longer muzzle isn’t merely cuter in the eyes of the ancients (and in my humble opinion, I find foxy-faced Volpini Italiani really adorable), but it also benefits the dogs, making them less likely to have problems with dentition, overheating and breathing obstructions. 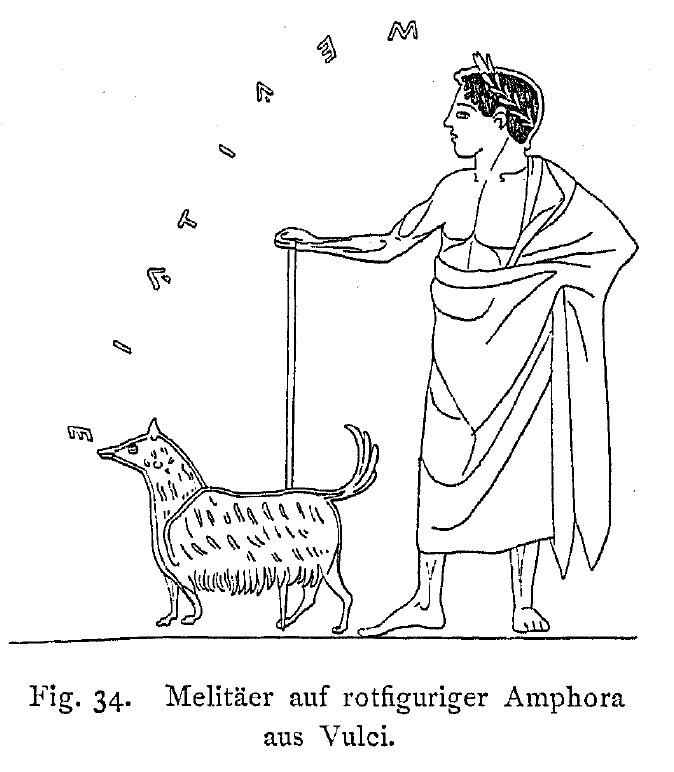 Thank you and I hope you all enjoyed reading about the Melitan, the all-time favourite miniature dog of antiquity. Catella Gallicana: Martial, Epigrams, 14.198. Mary B. Moore, “The Hegesiboulos Cup,” Metropolitan Museum Journal 43 (2008): 16. Posted in Uncategorized and tagged ancient pets, dog, Greek, lapdog, Maltese, Melitaean, Melitaian, Melitan, Melitean, Roman, spitz, Volpino Italiano. Bookmark the permalink. Whoa Carla this post is so awesome and thorough! Such an enjoyable read. Particularly love the terracotta head from the Met. Almost want to pat it, so cute. Thanks Meg, glad you enjoyed it! And yes, that rhyton from the Met was my favourite piece of visual evidence of the Melitan too. The face is so expressive. I left you a comment on another page, not this one! I apologize. This article is amazing. The vases and pictures are magnificent! I am currently writing an article on the history of ancient breeds. I will probably mention the Meletei and would love to include a couple of pictures, notably the Attic Stave Grele of a Young Girl, Melisto, Greece, from University of Mississippi, and the Chous, Child with a melitan ca. 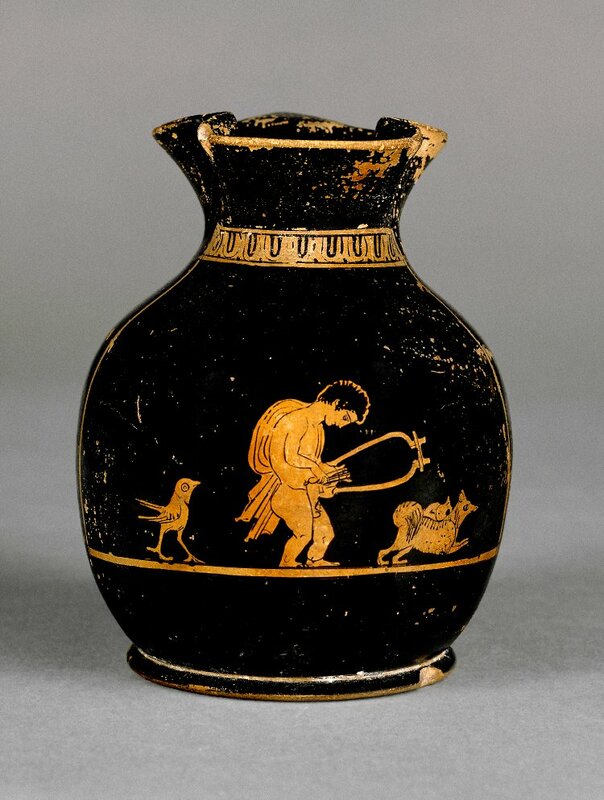 450-400bc.from the Harvard Art Museum. Do I need permission to publish those pictures, and if so, from whom, you or the sources. Thank you for you help. Again, this article is wonderful!! Hi Pat, I’m glad you liked my article about the Melitan miniature dogs! 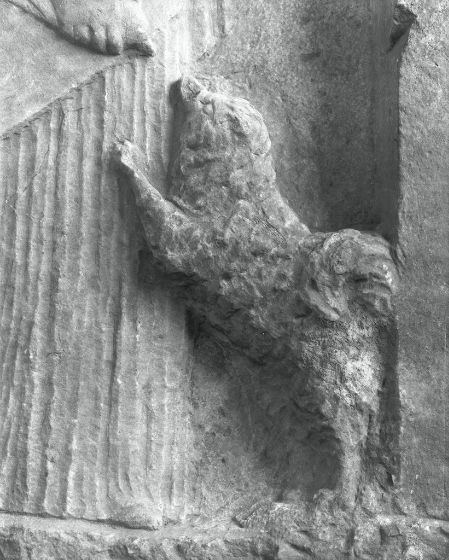 Under each of the images I’ve included a link to its source – if you put those links into an image bibliography at the end of your article, and a link to my Melitan article (https://foundinantiquity.com/2013/11/15/the-melitan-miniature-dog/), it should be fine to use the images. Thank you very much for the info. The article is going in a print magazine, not online. I will also check with my editor if your advice is usable for that format. The Melitian dog is probably a key to many breeds we have today. The world of dogs, especially ancient breeds is utterly amazing. I find it more fascinating than the history of the human, who tend to get in the way of themselves. Great work! As an owner of two Volpini Italiani and a former student of ancient Greek and Roman history, I loved your article! Cannot thank you enough for your research on this precious breed. I’ve owned several Volpino’s and have several ancient photos collected for our club groups and so happy to see you have even more and descriptions of what their history. I have some very old books dating back into the 1800’s on Rome, Greece and other countries filled with ancient sketchings so I will do more homework on my own to see if I can find more with this sweet little Melitian dog.